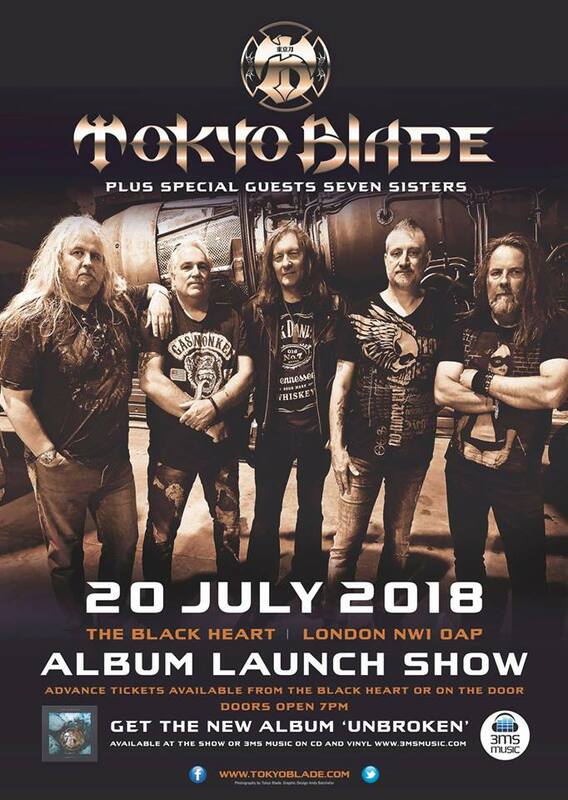 After last year's sold out London show, Tokyo Blade are BACK! and releasing a new album -with the original line-up for the first time since 1984! We will be showcasing the new album before they go on stage and they will be playing pretty special set list containing both old and new material- you're in for a treat! Tokyo Blade, from Salisbury, originally formed as White Diamond in 1979 before solidifying at Tokyo Blade in 1982. They are one of the key bands of the New Wave of British Heavy Metal era with three classic albums from the early 80s and they're still fantastic live. Unleash the beast! ✞ Seven Sisters - Born in the depths of West London, Seven Sisters are a four-piece band forged from the same steel as the NWOBHM acts of yesteryear. They combine a love for story and folklore with virtuosity and epic atmosphere. Over the course of the album there are twists and turns that take you on a journey embellished with melody, ferocity, and twin lead guitars to create a sound that, although familiar, is Seven Sisters' alone. It can only be described as heavy metal, but it is much more than that and is sure to cement Seven Sister’s place in the thriving metal scene.